Miss the Kickstarter Campaign? Excited to get your hands on the first Dreamprism Press Graphic Novel? Now’s your chance! Round out your chameleon and bat book collection with this colorful masterpiece! In addition to the book itself, the BackerKit store offers almost all the goodies from the Kickstarter campaign. The cut-off for this first printing is fast approaching so now’s the time to order! Check out these page samples to get an idea of the amount of love and dedication I’ve put into this book! 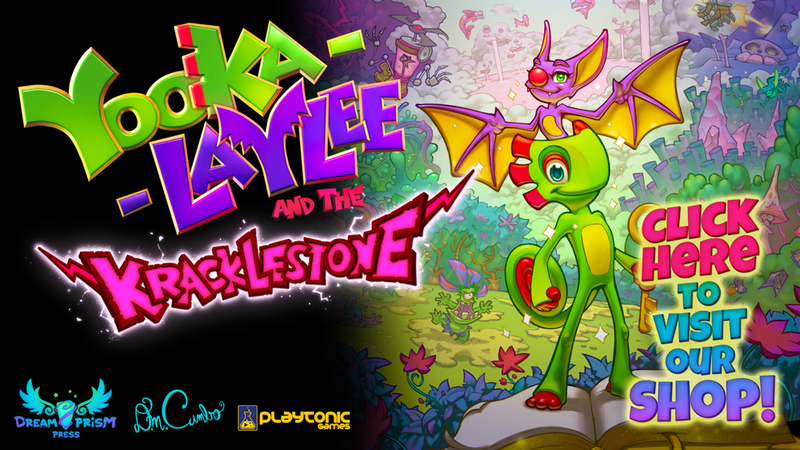 Yooka-Laylee and the Kracklestone is a fun story with a meaningful message at its core… Yooka’s headstrong insistence on being the sole hero will get himself… and his best friend, into some major trouble. He’ll need to learn to value the help of others to complete this wacky quest and keep ultimate power away from the hands (wings) of evil mad-scientist Dr. Quack! We’ve had a great campaign already but your extra support really makes a difference. Please spread the word to your friends and family, especially those with children! This book is the start of my library of graphic novels and illustrated books. Dreamside Book One is not too far down the road and there’s plenty more in the works! I hope you’ll be a part of this project’s success and kick off what I expect will be a very long line of Dreamprism books!